Most people ignore the importance of a toilet paper holder or even its quality because it looks like a very basic toilet accessory. Without a proper one though, your experience in the toilet would be much worse. Just imagine having to hold the toilet paper the whole time just to prevent it from unrolling or even prevent it from contact with the wet floor. Not a very good idea. 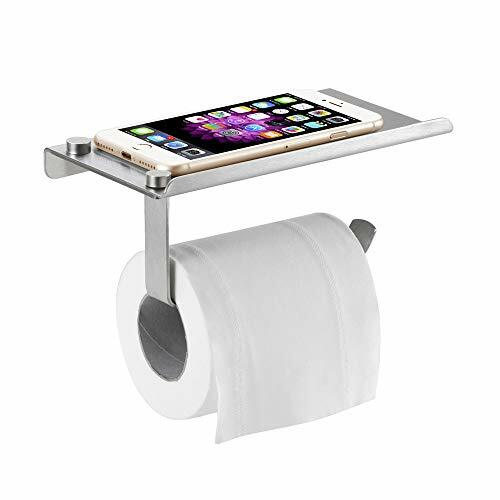 As such, it is not only important to get a toilet paper holder, but a good-quality product in which multiple-sized paper rolls can fit, and is firm enough to enable you to unroll the paper easily. 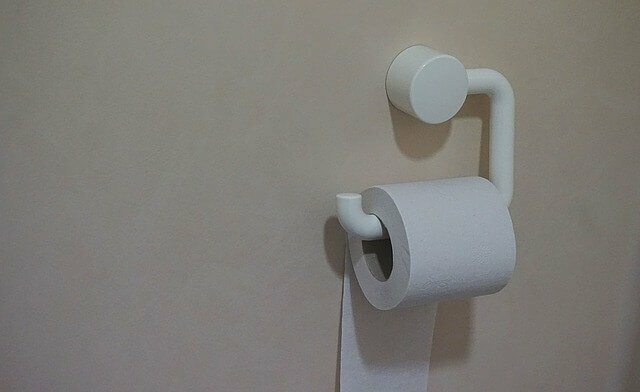 This article looks at 10 of the best toilet paper holders in the market so as to make it easier for you to pick the best one that suits your needs. 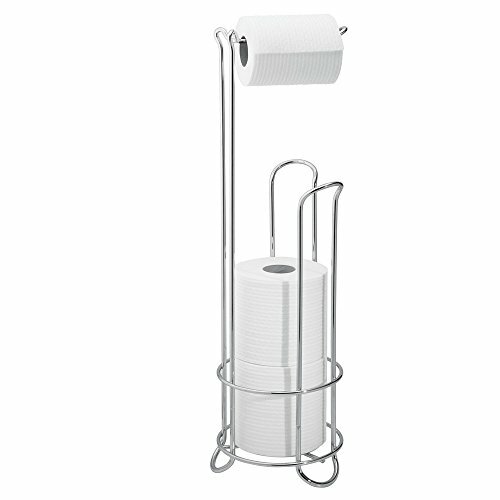 The SimpleHouseware toilet paper holder is a top rated product that incorporates both elegance and practicality in its design. It has a chrome finish that gives it an elegant look through its shine. Chrome is also resistant to rusting and is quite strong. This makes the unit very durable, which means that it will serve you for a long time. Practicality is incorporated in the form of being a toilet holder and a dispenser at the same time. 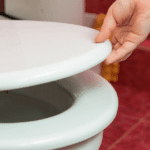 The product can hold up to 3 rolls of toilet paper in its “basket” and has a dispensing unit at the top that allows you to unroll the paper with ease. The rolls in the basket ensure that you never run out of paper during emergencies while the upper dispenser is raised to a convenient height so that you won’t have to bend a lot when unrolling. In terms of size, the holder measures 7.25 inches in diameter by a height of 23.5 inches. This is not very big and thus, it won’t take up much of the bathroom floor space. When it comes to installation, this unit is very easy to set up because it does not require wall mounting. You only need to place it on the floor right side up and you are ready to go. Very durable because chrome is both strong and rust resistant. Practical design. It holds 3 toilet rolls in its basket and one in the dispenser. 7.25 inches in diameter by 23.5 inches in height. Small in size but tall enough to bring the dispenser unit within reach. KES’s A2175S12-2 is the most affordable toilet paper holder in this review but this does not mean that it is a low-quality product. For starters, the unit is constructed using SUS304 stainless steel, which is very strong and does not rust. As compared to low-grade stainless steel, SUS304 stainless steel contains tiny amounts of chromium and nickel, which prevent rusting while steel provides the strength. The result of this is a very durable piece. In terms of installation, this product is a wall mount type of holder, which means that it requires some skill in order to attach it to the wall. However, this process is very easy and it comes with all the hardware required for installation. Additionally, the holder can be mounted in either a vertical or horizontal orientation to enable you to have the roll dispensed while either standing vertically or lying horizontally, depending on your preferences. When it comes to size, this roll holder is quite small. It has a length of only 4.82 inches, making it take up a very tiny space on your bathroom wall. Can be mounted either in a vertical orientation or a horizontal orientation. 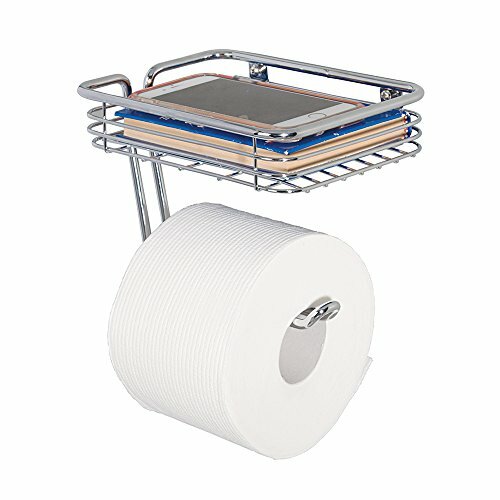 The APL toilet paper holder is also a wall mount type of unit, but it has an additional mobile phone storage shelf that makes it very practical. Most of the times, people go to the bathroom with their phones and use that time to chat or catch up with the latest news on social media. Well, when you are done using the phone, it’s not a very good idea to place it on the floor. On the other hand, it is very inconveniencing to have to place it inside your pocket because it might even fall off. That’s where the mobile phone storage shelf comes in, making this roll holder very practical. Additionally, this shelf is not only meant for phones. You can place soap or even your keys there as you use the toilet. 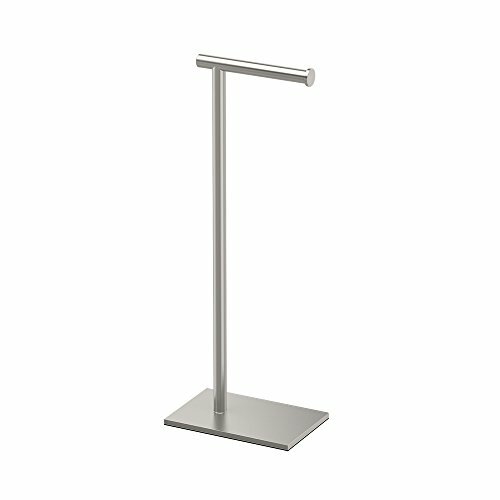 Structurally, this holder is made using SUS304 stainless steel, just like the KES holder above, and has a chrome finish. This means that it is very strong and durable, and does not rust. The smooth, shiny surface of this metal also makes it very easy to clean. 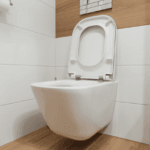 In terms of size, the unit measures 6-11/16 inches in length, 4-3/4 inches in width and 3-1/8 inches in height, which is still small and will not obstruct your bathroom space. Mobile phone storage shelf that can be used to place other things such as keys and hand sanitizers as well. Made using SUS304 stainless steel. A chrome finish gives it a very shiny look. 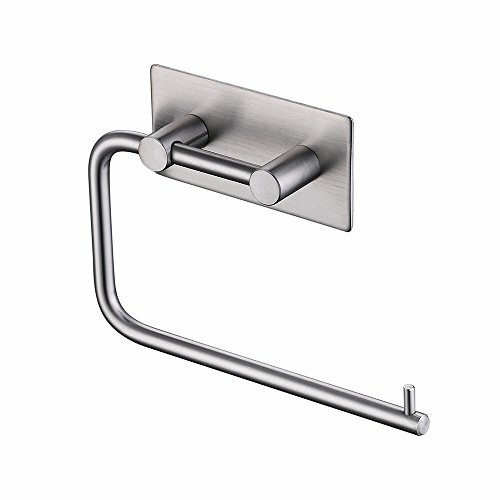 This toilet paper holder is available in 4 finishes, which include polished chrome, satin nickel, oil rubbed bronze and matte black. All these are rustproof and their different colors give you multiple options to help you find the perfect match for your bathroom’s interior décor. What should worry you, however, is the installation. A 5 × 5-inch hole is required to be dug out on the wall so that this holder can fit. This means that you might need a professional to handle your installation. The insert, which is constructed using aluminum, is telescopic and this is because it is closed in on both ends. It has to be compressed inwards so as to insert the toilet roll, and this limits the roll height that can be used. On the bright side, this kind of setup provides a very rigid support, enabling you to pull and cut the toilet paper without the holder moving one bit. Again, by being sunk on the wall, the unit barely protrudes outwards, leaving you with an almost flush bathroom wall. Available in 4 finishes (polished chrome, satin nickel, oil rubbed bronze and matte black). A bit difficult to install but provides very rigid support to the toilet roll. InterDesign’s toilet paper holder is the most expensive one in this review, but this is because it does not come alone. The holder is sold as a 3-piece set containing a toilet bowl brush with a holder, a 5-liter steel step waste can and of course, the toilet paper holder. From this purchase, you get 3 very essential toilet accessories and thus, make it worth the money. Back to the roll holder, InterDesign’s unit is a very practical holder that contains a storage space for up to 3 toilet rolls while dispensing a fourth one at the top. This means that you can never run out of toilet paper because you will always refill the reserve once it has 2 or fewer rolls. This makes it quite similar to SimpleHouseware’s holder, including having a chrome finish, which means it is rustproof and thus, very durable. It also has base feet that keep the reserve rolls off the floor, which is very important, especially if the floor is wet. For the dimensions, it has a 6.5-inch diameter, which means it occupies a very small floor space. Its height goes up to 23.75 inches, making it easily accessible. This floor placement design means that the holder does not require any installation process because it operates in a plug and play manner. Comes as a set of 3 (a toilet bowl brush, a 5-liter steel step waste can and a toilet paper holder). 3 toilet roll reserve and a dispenser at the top. Base feet keep the reserve rolls off the ground. Simplicity is the defining feature of Gatco’s 1431SN tissue holder. 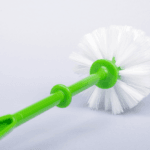 It is basically a stand with a square base and a pole that holds the tissue dispenser 22.25 inches into the air, which gives it a minimalist design. However, the product is available in a more complex design that has a storage unit, but this is much more expensive. Regardless of the design, the square base in each unit is weighted and this gives it more stability when unrolling the tissue paper while also improving its stature. The product is available in 3 of the most popular finishes, and these are satin nickel, matte black, and chrome. Each of these finishes is carefully hand-polished to have a shiny finish while the variety gives you at least 3 options to choose from so as to match with your bathroom’s interior décor. Holds the dispenser 22.25 inches into the air. Available in a complex design that has a storage feature. Available in 3 types of finishes. mDesign’s paper roll holder is an affordable wall-mount type unit that is available in a variety of finishes, which include chrome, satin, matte black, matte white and soft brass. These are built using a strong steel wire frame, then coated with either one of these finishes to create a rustproof, high-quality finish. 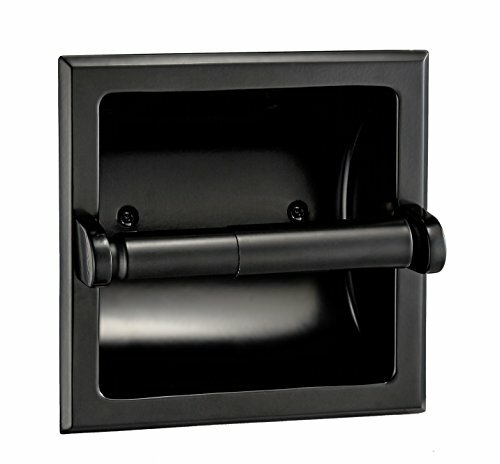 Although it is a wall mount type of holder, the product is very easy to install. You only have to drive in two screws into the wall and it comes with the hardware required to do so. Design wise, the holder has a storage shelf that is ideal for storing mobile phones, wet wipes, books, and other small accessories. Below this, an open-ended arm serves as the tissue dispenser. This arm is easy to refill and can accommodate different sizes of tissue papers, including jumbo-sized paper rolls. The unit is also thoughtfully sized in a compact manner, measuring only 7.25” in length by 5.25 inches in width by 5.3 high. Such a space-saving design fits well in small spaces such as in small bathrooms and small powder rooms. Available in 4 types of finishes. As the name suggests, this is an adhesive holder, which means that it should be mounted on walls using an adhesive. The good thing though is that it comes with a 3M adhesive strip, which makes it easy to install but the not so good thing is that it limits you to the types of installation surfaces that you can use. Only smooth surfaces can attach to this adhesive, which means that the unit can only be stuck on smooth ceramic, glass, stainless steel, baking finished surfaces, marble stone etc. 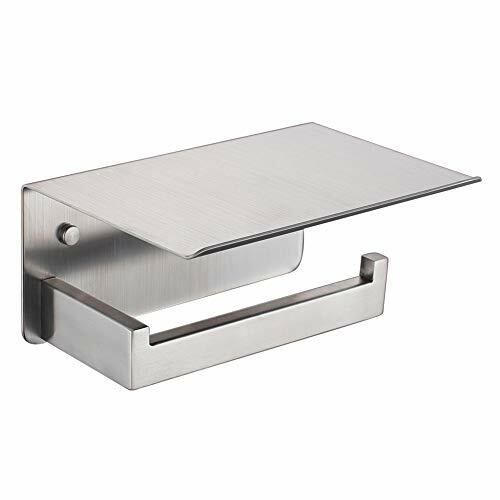 Structurally, the holder is made using type 304 stainless steel, which makes it very sturdy, and has additional 18/8 chromium/nickel elements that make it corrosion resistant and rust proof. Overall, this type of construction makes it very durable. Apart from being durable, this unit is very safe to use. It is carefully designed with no sharp edges, making it safe for kids to use. Functionally, the product has a long dispenser arm that can hold small tissue rolls to big sized jumbos quite easily. Additionally, this arm can rotate 180′ around the adhesive plate, making it possible do a reverse installation of the holder and the setup will still work. Easy to install using a 3M adhesive strip. Can only be installed on smooth surfaces. 304 stainless steel construction makes it very durable. Long dispenser arm can accommodate both short and long toilet rolls. Does not have any sharp edges and therefore, safe for use by kids. This model from mDesign is made with simplicity in mind. It has no shelf or basket, which means it occupies a less space as compared to other types of holders. This also means that it is very affordable as these fewer features lower its value. However, this does not mean that the unit a low-quality product. For starters, it is built using steel wire, which makes it strong and sturdy. This steel construction is coated in either one of four rust-resistant finishes, which are satin, matte black, matte white and rose gold, and this gives you 4 finish options to choose from so as to match with your bathroom’s interior. The product’s minimalistic design also makes it very easy to install because you only need to attach it to the wall using 2 screws, which come with the holder. The screw slots are easily accessible when fastening it to the wall and this drastically simplifies the installation process. 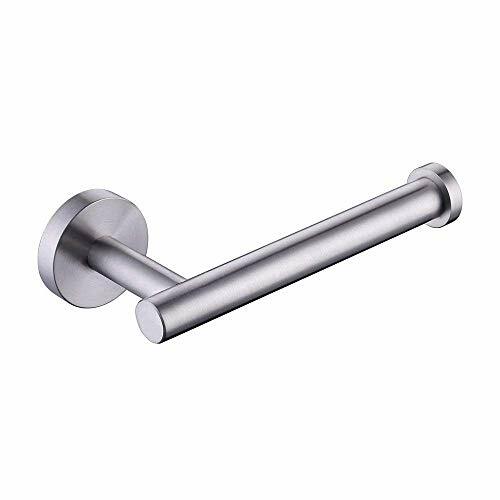 A door-handle-like compact design makes the unit ideal for small bathrooms and powder rooms because it occupies a very small amount of space and go almost unnoticeable. Steel wire construction makes it very durable. Four rust-resistant finish options (satin, matte black, matte white and rose gold). Bosszi’s wall mount toilet paper holder is available in three options. This specific one is the most affordable option while the rest acquire more novel appearances and are consequently more expensive. All of them have cell phone storage shelves, which can also be used to store other things such as keys as you use the toilet. On the outer end, a baffle design helps keep the items placed on the shelf from falling off. This is a very important feature because it can keep your phone from falling and cracking its screen. Below this phone shelf is the dispenser arm, which has a curved design at the end to prevent toilet rolls from falling off. Construction wise, SUS 304 stainless steel is used to build the entire structure, while a brushed aluminum coating is used to give it a polished, modern look that is rust proof and also very easy to clean. If you have a small bathroom, this unit should not worry you. It is roughly 7 inches long by 3.5 inches wide, with a height of 2.75 inches. This makes it suitable for most toilet paper rolls while occupying a very small space on the wall. Available in 3 options, with increasing novel appearances. A baffled design on the outer end. Curved dispenser arm to prevent the toilet roll from falling off. Durable stainless steel construction with a brushed aluminum coating. Durability is a very important factor to consider because you wouldn’t want to waste your money on an item that will crumble after a short while. Generally, stainless steel construction is the best on the internal frame with a coat of a rustproof and corrosion-free paint or metal. This helps maintain the strength of the unit as you pull the paper, refill or use the top shelf while the outer layer keeps the inner steel layer from decay. Such a product is the best one to buy. The rustproof coatings used usually have different colors. For the best look, the finish of this coating should match your bathroom’s interior décor. For instance, if your bathroom has white tile walls, chrome or other shiny metallic surfaces can go with any color, including white. 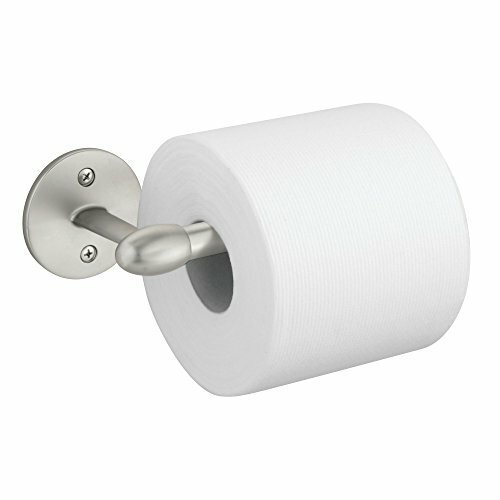 Alternatively, you can opt to buy a matte white toilet paper holder so as to keep everything white. However, a matte black finish would not be a very good fit. Another thing to consider when it comes to finishing is the design. There are those holders that are intricately designed with things such as caged baskets while other have minimalistic designs. These appeal to different kinds of people and therefore, it is important to buy the design that you prefer the most. Its mounting type defines a holder. There are two main mounting types. Toilet paper stands are not really mounted types but are only placed on the floor and that’s it. They are very easy to install. On the other hand, wall mount holders require a little bit more work to install. However, they support the toilet roll much better and maintain their rigidity even as you unroll the toilet paper. 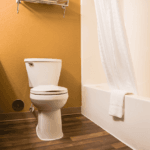 However, the size that you have in your bathroom should be the guiding factor. Stands occupy more space than wall mount holders and thus, are fit for bathrooms with larger spaces. Wall mount holders are best for bathrooms with smaller spaces because they do not occupy any floor space and some designs can be installed inside the wall to save on more space. Accessories are always an added plus. Most holders are bought alone but some come with accessories such as toilet brushes and waste cans. Although these are good to have, it is important to check the price tag of such holders because these additional accessories might cause them to be significantly more expensive. With a good quality toilet paper holder, you won’t have to struggle anymore to unroll the paper or cause wastage due to an unintended unraveling of the paper roll. By going through the described products above, you will get a good understanding of what the best toilet paper holder should be like. 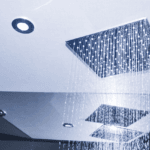 You should also get a suitable product for your bathroom, either as a new one or to replace the old one that you have.